Vredenburgh Lot in New Amsterdam . Dear subscribers I would like to apologize for the delay in getting this publication to you. Due to a death in the family, and having other family members suffer strokes this year, has made for a very exhausting year. Since issue three was not going to make it out in time, I decided to hold it back and combine it with issue 4. I would like to thank all of you for your support, and for all of the contributions to this publication. William Vredenburgh, Revolutionary War Veteran, and Three Generations of his Descendants. NOTE: I have not retyped the rest of page one. Pages 2 through 4 are a very early version of my William Vredenburgh paper. Here is a link to that paper. SOURCE: Aldrich, Lewis Cass, 1892, ed., History of Yates County, N.Y., with illustrations and biographical sketches of some of the prominent men and pioneers (D. Mason & Company: Syracuse) pp 74 75. Charles Williamson claimed of the State on behalf of his principals compensation for the total amount of 37,788 acres of land, a portion of which land lay with in the county of Yates as afterward established. One parcel was a 320 acre tract reserved by treaty to Joseph Poudre, and which was in the towns of Seneca, Ontario County and Benton, this county; another was a tract of 2,600 acres surveyed to William J. Fredenburgh in the towns of Torrey and Milo. SOURCE: Cleveland, Stafford C., 1873, History and directory of Yates County, NY (Yates County Chronicle: Pen Yan, NY) Vol I, Chapter XI, p. 636. Lansing's Purchase was a tract granted by the State to John Lansing Jr., lying west of the tract purchased by the Friends, about two hundred rods wide, extending south of Ryckyman'' Location about 5 miles. And lying directly west of Lansing'' Purchase was Vredenburgh'' Purchase, extending west to the Old Pre-emption line, and coincident at its southern extremity with Lansing'' Purchase. South of both Vredenburgh and Lansing tracts was James Walker's Location, embracing over five hundred acres. The survey of the New Pre-emption Line brought the Vredenburgh, Lansing, and Walker tracts within the Phelps and Gorham Purchase, and even cut off eleven hundred and forty-seven acres from the Potter Location, a triangular tract lying between Lansing's Location and the New Pre-emption Line, known as the Little Gore. BIRTH: Revolutionary War Pension File #S11629. Jacob states, "to the best of my memory I was born in September of 1759 at a place called Taghkanic on Livingston Manor in Columbia County, New York." BAPTISM: Gallatin Reformed Church, Gallatinville, Columbia, New York (page #8, Record #171). Name: Jacob Vredenburgh; Parents: Isaac Vredenburgh and Cornelia Witbeck Date: bapt. 28 Oct 1759; Sponsors: Phillip Free and wife Catharina Schoop/Sharp. MARRIAGES: Married first: Contente Rollins. No marriage record found. Only proof is the baptism record of their first born child, Jacob, at Livingston Reformed Church, Record #1622. Their son was born 31 Oct 1781 and bapt. 14 Apr 1782. They may have married about 1780-81 somewhere in Columbia County, New York. They had a second child, Cornelia born Jan 1783 and baptized at the West Copake Reformed Church, 15 Feb 1784. The name of Contente as this child's mother is omitted from record and a Aunt is listed. Contente Rollins Vredenburgh must have died. Married second: Catharina Kohl. No record found in Columbia County, New York. Married third: Margaret Shaw Smith. No record found in Yates County, New York. DEATH: 11 Aug 1850 Rushville, Yates, New York. Received this date from the Rushville Town Historian who found it in the old town records. He stated that, "Jacob was 91 years old and buried with no stone marker." He did not state which cemetery Jacob Fredenburgh was buried in there. MILITARY: Revolutionary War Soldier. May 1776 Jacob drafted as a Private into the Columbia County Militia, a Regiment belonging to Colonel Livingston. Pension file #S11629 National Archives. Took part in Shay's Rebellion in Massachusetts 1786-1887. In 1787 he fled to Yates / Ontario County New York to more or less hide from the law for his participation in Shay's Rebellion. CENSUS: Federal Census for Yates County, New York, appears in the following: 1810, 1820, 1840. State Census of New York, Yates County: 1825, 1835. Yate County Census records show that both Jacob and Margaret alive in 1840 and both evidently dead before the census of 1850. NOTE: Need to check Ontario County, 1850 Census for Jacob in or near Rushville, NY living with daughter Mary Fredenburgh-Haviland. Jacob was born at Taghkanic on Livingston Manor in Columbia County, New York, Jacob was the first child born to Isaac Vredenburgh and his second wife, Cornelia Witbeck. Jacob states in his Revolutionary War Pension File #S11629, "to the best of my memory I was born in September of 1759 at a place called Taghkanic on Livingston Manor in Columbia County, New York." Church records from the Gallatin Reformed Church (pg. 8 record 171), Gallatinville, Columbia, New York show that he was christened there 28 Oct 1759 and that his parents were Isaac Vredenburgh and Cornelia Witbeck and his sponsors were, Philip Free and his wife, Catharina Schoop. As Jacob was growing up he may have lived with his parents in several different locations in Columbia County, New York. If you look at the christening records of Jacob's siblings they are recorded in the following churches; Gallatin Reformed at Gallatin, Claverack Reformed at Claverack and Linlithgo Reformed Church at Livingston. The family was located generally in the southeastern area of Columbia County. At the age of 17 and one-half years, Jacob was drafted into the Militia of Columbia County to fight in the Revolutionary Way. The Pension Record of Jacob tells us that he was drafted in early May of 1776 and at that time he was living at Taghkanic. Jacob was drafted as a Private into the Militia of Columbia and that the Company was commanded by Captain Conrad Kline and an Ensign ____ Van Deusen belonging to Colonel Livington's Regiment. Jacob served in the Revolutionary War for 2 and one-half years and was discharged at the age of 19 years. He fought in several important battles as mentioned in his pension Record. The most important being the surender of the British by Burgoyne to General Gates at Stillwater, New York. Jacob was discharged in the fall of 1778. Jacob returned home to Livingston Manor, Columbia County, New York in the fall of 1778. He married Contente Rollins about 1780 in Columbia County, New York. Their first child, Jacob, was born 31 Oct 1781 and christened at the Linlithgo Reformed Church in Livingston, Columbia, New York 14 April 1782. The christening record of this child states that his parents were Jacob Vredenburgh and Contente Rollins and that his sponsors were Peter Athuisen and Ariaentje Althuisen. Jacob and Contente had a second child born to them in January of 1873, a daughter named Cornelia. I believe that Contente had problem with the birth of this daughter. When Cornelia is finally christened on 15 Feb 1784, one year and one month after her birth, at the West Copke Reformed Church, the names of the presenters are her father, Jacob Vredenburgh and her aunt, Lyntje Vredenburgh Wilson and the sponsors are her grandparents, Isaac Vredenburgh and Cornelia Witbeck. It looks as if Contente died before the christening in Feb 1784 in Columbia County, New York. This child, Cornelia must not have been well either and died before 1787 in Columbia County, New York. Jacob weds for a second time about 1785-86 to Catrina Kohl and they can be found in the christening records for their children in the following churches: Copake Reformed, West Copake Reformed and Claverack Reformed all located in Columbia County, New York. The History and Directory of Yates County, published by S. C. Cleveland, 1873, pages 712-714 states the following: 'It is claimed for Jacob Fredenburg that he was an earlier settler than the Friends. But he was a refugee rather than a settler, and was hiding away from the arm of the law, when early in 1787 he fled from Massachusetts and took up his abode far in the wilderness among the Indians, when Shay's rebellion was quelled. Some of the malcontents fearful of punishment for treason took refuge beyond the borders of the colonial settlements where the jurisdiction of the government would not reach them. Jacob Fredenburgh was one of there. (Dr. Preston E. Pierce, Ontario County Historian informed me that: "Many of Shays men, including Shays himself, came out this way. Shays settled less than 30 miles from Jacob."). Jacob threw himself on the mercy of the Senecas, and they gave him a restricted hospitality. With his wife and one or two children he occupied a cabin near the present residence of Alfred Brown. The Indians permitted him to angle in Jacob's Brook, which it is claimed received its name from him. He was not allowed to fish elsewhere, but could hunt within certain limits and raise a patch of corn. The brook being profusely stocked with speckled trout, he had all the fish he wanted. Fredenburg remained about three years, when settlers were gathering in, and he then returned to the eastern part of the State. In 1800 he came back a widower, settled near Kenney's Corners and married Margaret Shaw, a widow whose family was Scotch. She had a large family and they were thenceforth known Uncle Jake and Aunt Peggy. After her death he lived with one of his children, the youngest daughter, by the last marriage. She had married Joseph B. Haviland and resided near Rushville. Her daughter Ida Haviland is the wife of George A. Ketchum of Penn Yan. "Another source of information for Jacob is the History of Yates County, NY, published 1892 by D. Mason & Company, Syracuse, NY page 279. "Jacob Fredenberg is said to have been a settler in Milo of earlier date that the Friends. He was a refugee from Massachusetts, having fled the State during the famous Shay's rebellion, and took up his abode with his wife and children on Jacob's Brook, in the north part of Milo as afterward organized. He is said to have come here in 1787. The Senecas permitted the settlement but restricted his liberties." This same source mentions that, "a tract of 2,600 acres surveyed to William J. Fredenburgh was located in the towns of Torrey and Milo. "This William Fredenburgh / Vredenburgh was also a Revolutionary War Soldier from New York and a second cousin once removed to Jacob Frdenburgh. Jacob is mentioned in the will of Isaac Vredenburgh, his father. Will dated 4 Mar 1790 and states that Isaac is from Hillsdale, Columbia, NY. At present no will or probate has been found of Jacob. NOTE: The above table is not exactly the one in the Vredenburg Searcher, I had worked with Ruth Ann Kelley and obtained the actual patent documents. This table adds the location of the patent (or deed), the acres, and the authority (Act of Congress) for the transfer of the land and the place residence of the applicant. 1840 Michigan Federal Census Index. No Fredenburgh or Vredenburgh and various were found in the 1820 or 1830 Federal Census for Michigan. NOTE: Please see Vol. 1, No. 3 for the 1850 Michigan Census index. Willem Isaacszen Van Vredenburg is said to be the ancestor of all the families names Vredenburg, Fredenburg, etc. throughout North America. After arriving in New Amsterdam of 17 May 1658 aboard the ship de Vergulde Bever (The Gilded Beaver) he served for a time as a soldier in the service of the Dutch West India Company. By June 1661 he had returned to civilian status, and he lived in Wiltwyck (now Kingston, New York) until 1664, when he removed to New Amsterdam, where on 19 Oct 1664 he married at the Dutch Reformed Church Apollonia Barents Kool, baptized New Amsterdam 29 Jan 1645, daughter of Barent Jacobsen Kool and Marretje Leenderts. He remained there with his family until 1678. Maps 1 and 2 attached hereto are taken from I.N. Stokes, The Iconography of Manhattan Island 1498-1909 (New York: Arnold Press, 1967), Vol. II, frontispiece and C. pl. 82. 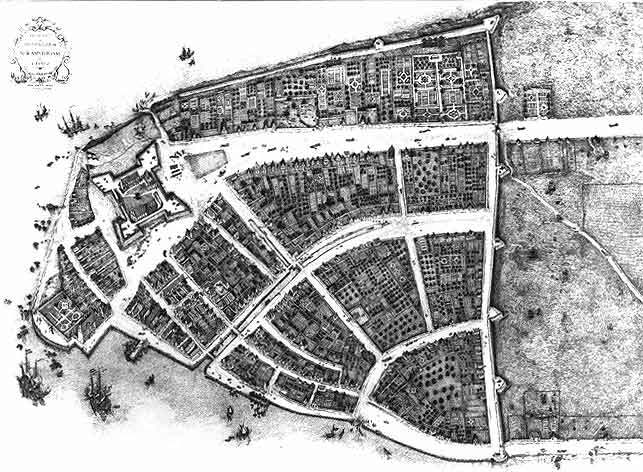 Map 1 is a sketch of New Amsterdam in 1660 as originally drawn by Jacques Cortelyou, surveyor. The sketch is known as the Castellano Plan named after the Italian villa where the sketch was later discovered. On the left is the Fort. Broadway is the large street leading in from the fort along the tree-line on the north side (right) lies the fortified wall erected to repel an expected invasion by the English (which never occurred); the adjoining lane later became Wall Street. On 1 Feb 1673 William Darvall, former Mayor of New Amsterdam, sold to "Willem Isacqse Van Vredenburg" A house and lot on the Heere Street [now Broadway], having to the north the Lutheran church and to the southe the garden formerly owned by the Dutch West India Company. However, in October 1673 the council of the city ordered the demolition of a number of homes, including this home, which were found to be too close to the walls and bulwarks of the city. Compensation was paid to the owners, and on 22 May 1674 the city surveyor set off Lot No. 2 in the Garden of the Dutch West India Company for "Willem Van Fredenbuch." Map 2 shows the location of the patent, which measured 2 rods (33 feet) frontage on the west side of Broadway, had a depth of 12 rods 0 ft. 1 in. (198 ft. 1 in.) had a rear line of 2 rods 1 ft. (34 ft.) and contained approximately 0.15 acres.